30 days of lunches: No repeats. 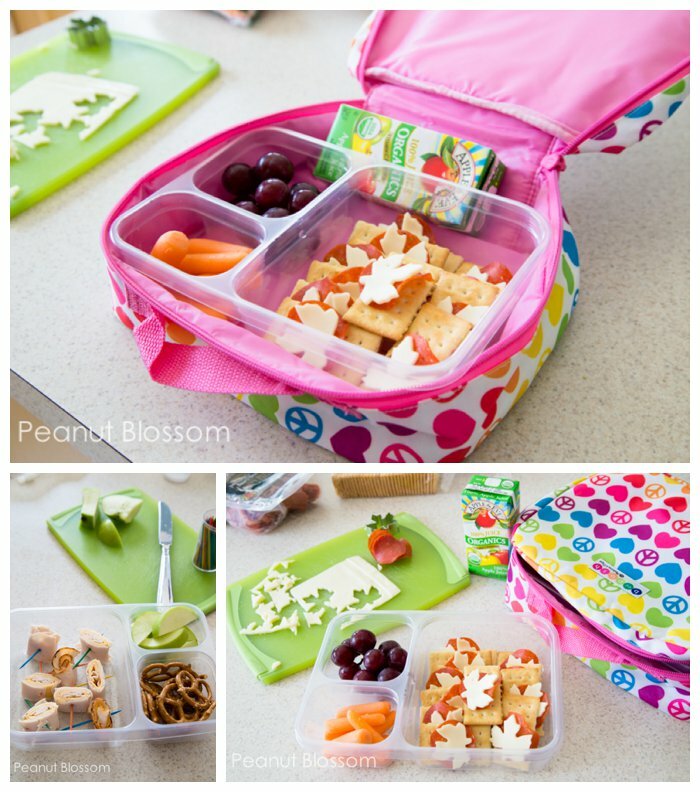 You will find ALL 30 lunch suggestions for packing lunch for your child right here in this post. We have everything you need for an entire month of inspiration and a happier kid. So what’s your favorite lunch combo for the kids? P.S. 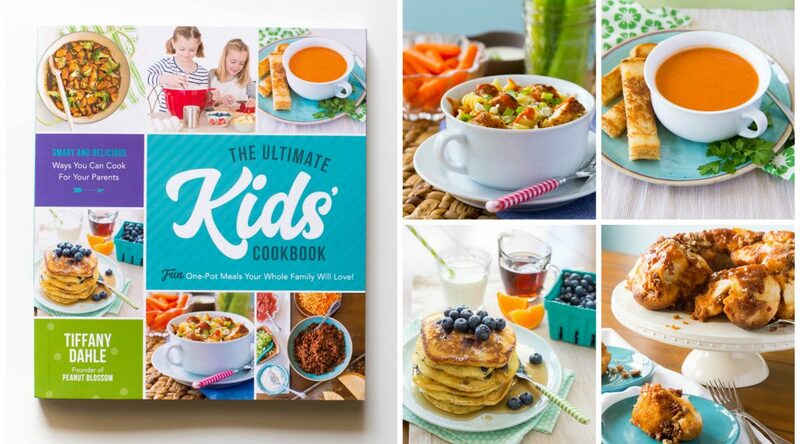 If you’ve got school-aged kids, you DON’T want to miss my newest cookbook: The Ultimate Kids’ Cookbook. 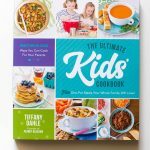 75 fun and delicious one pot recipes that kids can cook for their families. It is food that YOU actually want to eat. Get all the details here. P.P.S. Did you like this post? I would love to keep in touch with you over on Facebook! Please stop by and say hi and join our discussion! 1. Fairly light on veggies: I know the more veggies that get packed in that bag, the less that gets eaten and I hate throwing away food. We work on our veggie tasting skills together at dinnertime and I push the fruit for lunch instead. The few veggies I do mention are on the Peanut’s approved list. 2. Quick & easy packing: If you have the time and energy to be crafting animals and characters out of produce at 6 a.m. before your coffee more power to you. I don’t. These lunch combos take minutes to toss in the bag. That said, I find a simple cookie cutter and a handwritten note on a napkin works wonders! 3. No sandwiches! : Well, “almost” no. My girls get crazy tired of sandwiches and several times last year the Peanut would come home with a lunch bag full of bread. She’d eat the filling and leave the rest! I have several methods of getting that filling presented besides putting it in between 2 slices of bread. 4. Nut free!! : Probably the most important factor here. The Peanut’s school is peanut-free, so no peanut butter or nuts appear in these suggestions. Plastic bento-style containers: Buy the easiest lunch boxes here. Methods for packing lunches: I have 4 presentation methods I rotate depending on the ingredients and food. 1. Roll-ups: The Peanut’s favorite. Take the meat and/or cheese, lay it flat. Roll it up like a burrito. Slice it into chunks, hold in place with toothpicks. 2. Stackers: I call this the “make your own lunchables” method. 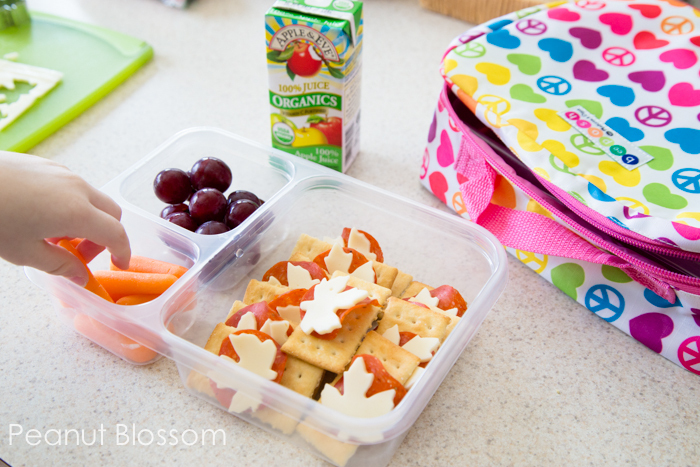 Meat, cheese, crackers, and assorted toppings are presented for the kids to mix and match their own bites. 3. Nibble Plates: Also known as “What on earth do I have in the fridge? !” day! Random bits and pieces that have some seemingly cohesive theme are presented in their own containers to nibble on. Bits of leftover chicken, fruits, veggies, etc. 4. Cut-outs: There are a precious few sandwiches on this list. When they hit rotation, I use a larger cookie cutter to remove the crusts. My favorite is a scalloped heart shape that uses almost every ounce of food with little wasted edges. 30 Days of Lunches No Repeats! 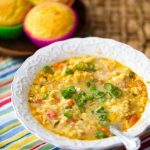 Looking for more great ideas for feeding the family? You do NOT want to miss out on my weekly email newsletter where I share festive and fun seasonal tips. I had catered to my two boys’ limited palates all through preschool since there was no lunch provided where they attended. But when both went off to kindergarten, we took advatage of the school lunch offered to address two issues: 1) betaing picky-eater syndrome and 2) getting my shy kids to interact and transact. I’m glad we did. Both took the school lunch until they were old enough to pack their own sack lunch. This is fantastic! Thanks for the list! I can use several of these ideas! Julie, I agree with that tactic completely. We tried it last year only to discover that the Peanut’s school doesn’t do the single option lunches from my childhood. It’s a true cafeteria where the children are given choices. She was choosing horrendous nutritional combinations. A typical lunch consisted of: 1 chocolate milk, 1 juice box, a plate of french fries, and a cookie. Yikes! More info coming on that next week! Thanks for sharing! The recipes look great. Does anyone know where I can find the bento box containers and the lunch bag to hold them? The one(s) in the picture look perfect. These look amazing. Thank you so much for sharing! How do you keep things warm? ?? Hannah: I’ve found the green apples don’t go brown as fast so it usually isn’t a problem but if you’re worried, a little pineapple juice or lemon juice will help them stay fresh. Patsy: All of these meals are intended to be served cold, I’ve never tried to keep things warm. An ice pack in an insulated bag should keep them safe until lunch time! I’ve heard other moms us Thermos bottles if you want to try hot lunches! We do warm lunches like soup and leftover pastas. I use a Thermos Foogo lunch container. It’s the perfect size for an elementary kiddo!! Great ideas! What is cookie butter?? Also, for apples, I cut mine in four pieces (trying to leave them slightly attached at the bottom), close it up and wrap in saran wrap (and can put a rubber band around it if you need to). Helps keep it from getting brown. Believe I found the idea on pinterest. In Canada, fenigo.com has an abundance of litterless lunchbox products and ideas. Well worth a visit. :). I like the goodbyns because there are no little parts to lose and i can toss them in the dishwasher. Happy lunching! How do I join pintrest ??? Awesome ideas! Great for the little guy. Anything for high schoolers? We are “nut” free also. We use Sunbutter with the jelly. It’s made from sunflower seeds. There is Soybutter too not as good. My son Gavin is such a picky eater, and has peanut, and tree nut allergies. You have given me great ideas to start his Kindergarten year! Thanks! Keep them from going brown! OMG…. These are but snacks/starters. Bring on REAL FOOD ideas, these would never feed a Country Boy who Moves! Typical lunch for 1 boy here is Leftovers (mealtime) in a 4x4x2″dish (or Sandwich with meat, lettuce/cheese), Granola Bar, Juicebox, 4 Carrots, Yogurt Cup or Fruit Cup, Apple, A piece of desert square or a Muffin. As well he will buy a Milk thru the school Milk Program. His lunchkit is FULL but empty when he arrives home. I chuckle at these tiny lunches – wonder if that’s why some kids do poorly at school, not enough to eat! This is very helpful as I cannot stand making school lunches! This gives me simple crafty ideas! Thank you! You’re my hero!! If I give my girls one more round of quesadillas, grapes and apple slices they may turn their forks on me! 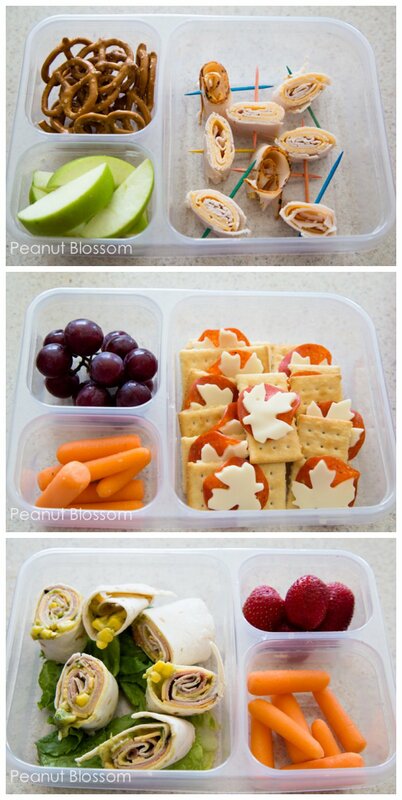 Great ideas for school lunches!!! Now we just need 30 days of yummy gluten free packable kids lu chess! Michelle, I was thinking the same thing! That little amount of food wouldn’t do for a kid in upper elementary grades. Thankfully our elementary schools don’t have cafeteria’s….they have a healthy hot lunch program 2-3 days a week and other days we pack a lunch. Hi, I like to use a gluten free hot dog bun sliced into mini bread like pieces. Your meals are the perfect size for all those picky eaters that would rather go the day hungry than eat what they have in their lunch kits. I have run a home daycare for 25 years and I see this with all my kindergarten kids. Kudos to you for coming up with these fabulous ideas. Thanks and I’m sharing with my daycare moms this ideas. Is there a recipe for grilled corn guacamole? Or is this something you can purchase at the store? Love the recipes but I am faced with 3 very picky boys. Lunches are not fun for me. Any suggestions to get them to be “out of the box” with their eating habits? I would love to make all of these but I know we will see a lot of this food back at the end of the day and maybe wasted. Please help? My daughter was picky in kindergarten. I had to be imaginative. I would use a sugar cone, smear peanut butter inside and give her a little container of chocolate chips to put in before eating. Another thing she liked was imitation crab meat in her lunch. Another idea for picky eaters- try muffins. I usually keep some in the freezer and throw in it the lunch bag, usually defrosted by lunch. Frozen go-gurts, yogurt covered raisins, those summer beef sausage sticks (I’ve found some that are already small and cut up), favorite hot dishes in a thermos (mac n cheese, spaghetti). These are great ideas for my girls. Do you have the recipes for some of the things in your menu? 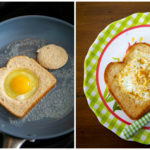 Making lunches is the HARDEST thing for me…thanks for these ideas! My sons school is also nut free. Is the cookie butter allowed there? Just reading the label I see it may contain tree nuts and other tree nuts. Do you have any other suggestions of what I may use? These ideas are great! I tried ordering the lunch boxes via amazon..but they do not deliver to Malta:((( Does anyone know of another website from where I can order similar ones? We’ve used the divided Ziploc containers you show for going on four years now and love them! Walmart and Target both carry them year-round, not just at ‘back-to-school’ time. They are typically with the other plastic food storage containers and cost less than $3 on the East Cost for a packaged of 2 containers. Less than a box of sandwich bags, and you can reuse them for years! I love this revealing detailed post on bento, espacially the fact of you mentioned that what kind neutration to go in boxes.Japanese lunch boxes attribute all these features to fit there. These meals are good for my toddler, but would not fill up my 1st grader or my 2nd grader. They’d come home starving. I love the idea. While the portions are fairly small for some children, simply increase the amounts. It is an idea page, not written in stone that this must be followed exactly as is! This is a bento type box that I think is amazing. Inside the larger box, you can fit two of the triangle shaped boxes (each can fit a full sandwich when cut in half and stacked on top of each other) and two of the small rectangle boxes. These can be mixed and matched at will. The main lid incorporates not only an ice pack (included) but also a fork and spoon that are actually of decent size to use! The containers can all be put through the microwave and are BPA-free so nothing will leach out after multiple uses. You can keep salad dressing and runny toppings separate, put soup in one of the triangles and basically mix and match to make the box work for that days toppings. Top-rack dishwasher safe and the lid locks in place- the smaller containers all have lids attached so you don’t lose them. This is definitely of a size for the older kids and holds much more than those ziplock containers and the lid is much more secure in preventing leaks so you can store it sideways. This is great!! I would love to know some of the brands that you use and feel are safe for you! Wow this is great. My kids will love it. Excellent ideas! My boys are very picky eaters, one vegetarian and one omnivore. Also peanut free school. It got to a point this last year where they wouldn’t eat anything I made, even if it was previously a “can’t do without” item….. My solution was to make them create their own lunch menus that I would approve and shop for and THEY make their own lunches, so no more complaining…. HA! It worked! I’m going to share this with them, so they can get some new ideas for what they are going to make as we gear up for the school year! Thanks! I don’t have kids – but I take my lunch to work everyday and get tired of a sandwich (no one needs to eat that much bread) or a salad everyday. I like your ideas and plan to see how it works for me. Thanks for sharing! Many are talking about the lunch ideas, which they are just that and idea, are to small and would never fill your child up. Having worked in the school system and watching children from 3rd to 6 grade toss out lunches. Your child that might have an hefty appetite might been one that tossed out the breakfast and lunch. I would say over 80% tosses out food. The children that bring from home either will 1.) exchange for a food item from a student that bought from the cafeteria or 2.) will toss out or just give away there food. Yes, I seen it all! The ones that do buy from cafeteria will pick the good stuff off and toss the rest or just toss it all out. Children’s taste change all the time. This seems to be a good rotation idea that will keep a different pace for a child. But, of course if your child doesn’t like an item don’t pack it! As a mom with a child who has a shellfish allergy- please be carefully sending shrimp to school! Some kids may not know that they have been in contact with a major allergen. AWESOME!! Love your ideas. I have some picky eaters. Lots of great lunch ideas. Some great ideas! Please be aware that pesto is made with nuts and is very dangerous for those with nut allergies. I have a child with nut allergies. You would be surprised by the number of people of forget that pesto contains nuts. I’m not sure if they don’t know the ingredients or really consider pine nuts true nuts? LOL about your “the toddler” lunch combo! so correctly named. 🙂 i have a toddler and that would def be her favorite lunch. my 5 yr old is just starting k5 this year, so this post totally helped me get out of the “”sandwich, chip, fruit” rut” and open my eyes to the awesome lunch combos out there. thanks for such a helpful/great post! Great ideas!! Do you have a good recipe for pesto without nuts? Pesto traditionally requires pine nuts, but I often sub in almonds or walnuts, depending on what I have on hand or feel like making. Seems like if the school doesn’t allow nuts, you could have a problem on your hands. Or was it just peanuts that are prohibited? Maybe I missed that detail and generalized to all nuts. Just curious to see if you have a good pesto without that element nonetheless. Thanks! I don’t get all this need to cater to picky eaters. As a kid in the 1970s, I tried to be a picky eater. It didn’t work, because the option was to eat what mom had packed or go hungry. I don’t recall hearing about any children who starved to death back then, either. Children today are picky — and get away with it — only because they know their parents will give in. Our three boys (triplets) aren’t picky, because we didn’t give them that option. Eat what you’re given for lunch or be hungry. With triplets, a lot of that nonsense just never gets started, because we don’t have time to deal with it. The real question is why so many of today’s parents allow the children to be the ones in control. Parents need to act like adults and do the parenting. Thank you for this great list! Just in time for another school year. Hope you don’t mind if I share & link back! Lets not get into the mommy wars. Congratulations on your child not being a picky eater. That could be because of your wonderful parenting or it could just be that your children are not picky eaters. Some picky eating is because a child is trying to exert control over his life but that isn’t always the case. Science actually has found that different individuals experience taste in different ways. Taste buds also mature at different rates and it could be something as simple as a child’s taste buds aren’t mature enough to handle a particular substance (this is biological and very different from a child’s emotional maturity being ready to handle the new items). This also explains some of the issues children have with certain textures being highly unpleasant. Then there are the children whose tastes differ greatly from their parents; a parent may enjoy bland food while the child likes things flavorful and spicy or vice-versa. A child could be picky about the food they are served at home but maybe not elsewhere. Taste is something a body does have to learn over time but it is also a personal preference and no matter how much training a person endures, they will never learn to like some things. Even children can have their own opinion on food. I hated tomatoes and mayonnaise from infancy and to this day I still can’t stand them even though I have tried them in many different ways. I was a picky eater growing up and there is nothing in the parenting I received to justify it. I was exposed to a wide variety of foods from an early age. I was never force fed anything to the point of making me feel a need to control food. Did I go hungry? Yes. I waited until there was food I did like available and if I didn’t like it, then I ate the very minimal possible to avoid extreme hunger pains. I ate the school lunch maybe 25% of the time. I didn’t whine and complain, I simply did not eat. It wasn’t a case of eat what is in front of me or starve- it was a case of being hungry for a day or two until something acceptable came along. Almost no child in America is served something they hate every single day. So are saying these lunches are too small. My kiddos only get 15 minutes to eat lunch, and a couple eat like birds even though they are country kids running outside and playing most the day. These are perfect! What do you put on your apples to prevent them from turning brown?? To keep pears and apples from turning brown, cut them up, then soak them in a solution of 1/4 cup lemon juice and 1/2 c water. You can just dip them too. I usually let them in for about 30 seconds. Great ideas, especially for a young child. This offers good snack ideas, too. Thank you. Unfortunately, one of mine has been placed on a high-protein, nut-rich diet by her endocrinologist. We’re blessed to be at a school that is not nut free, but goes to great lengths to keep those with nut allergies safe. My peanut’s dietary needs couldn’t be met at a nut-free school. I packed a lunch every day for my healthy eating high school athlete last year. Saved lots of money because our school lunch prices were increasing and food was decreasing. These boxes were awesome! And I jammed packed them with raw as well as cooked veggies. Feeding a high schooler is totally doable. So glad I found this site (someone posted this on FB). LOVE these ideas and they will be put to use! I do have a question, that never seems to be answered when I’ve asked before: when slicing apples for lunch, do yours turn brown? I know it doesn’t hurt the taste, but my soon-to-be 1st grader NOT touch a brown apple 🙁 So it’s always grapes or strawberries for lunch, which he gets bored with. Thank you! I should have looked at the prior comments. Sorry! You cannot use the toothpicks in your child’s lunch. This is a big NO – NO. Any of these have to be heated up? My child is lucky, she is in a special ed classroom & has a microwave. Maybe schools should provide this in lunchrooms. In high school I rem having one. By buying all these fresh fruit that a typical family can’t buy how much went bad? Can u freeze fruit? How much did grocery bill go up? A favorite for my Toddler is hummus with veggie straws. I predip (bc she was only 12 months at the time) and stick them standing up in a compartment. Good protein. Here’s another tip for keeping things warm: boil water and put it inside your empty thermos for 3-5 minutes. Dump the water and then fill with your lunch item. The hot water helps heat the thermos and keep your food warm longer. Have a great school year! I just came across this blog before school started this year and wanted to know that it’s been a lifesaver for me! My daughter just started carrying her lunch this year and insisted that I not pack sandwiches so this has been great. Thank you so much for sharing! Thank you SO much! I’m super excited to try some of these out. As a busy working mom I never get the chance to sit down and dream up ideas other than a boring old sandwich and fruit. You did the work for me! these bento photos are always so lovely…but i can’t imagine the cuteness is intact after transit to school, being tossed into the lunch bag bin, etc…? they look good, too attractive to eat, lol. anyway, i read somewhere that those baby carrots are ot the real thing. they were made like french fries. the carots were mashed and molded to a uniform size and hue. i stopped buying them since i learned about it years ago. As much as I love the suggestions (and they are needed!) my heart sank when I saw how little your lunch ideas needed to be. My 2 kids are HUGE eaters. Both are very thin but with massive appetites (wish I could say they get it from me… Haha). All of what you have packed is one snack for my two. Plus I would need to pack the actual lunch. An afternoon snack and an after school snack. My 6 year old eats a footlong subway meatball sub! Their lunches for the day usually include… A kids protein bar and Apple with sun butter. A sandwich with cottage cheese, raisins and banana. Greek yogurt and crackers. And hummus and veggies. And I’m told they still say they are hungry throughout the day. I guess I need suggestions for “adult size lunches” for my 3 and 6 year old. I had no idea so many children had nut allergies and was wondering how in the world am I going to pack a tasty lunch that will be missing so many of the things my LOs enjoy and then I found your site. These are wonderful ideas. I thank you for opening my mind to possibilities for my 2 LOs (2 and 4) and some great bento ideas for myself. These ideas are great! I’d love to share your page with my followers if that’s ok? I’m sure many of them will really appreciate the help as we come up to ‘back to school’ time! I think it is so wonderful that you put so much love and attention into your child’s lunch. That, I believe, is the most important nutritional lesson we can bestow upon our kids-that food made with love and care nourishes our souls as well as our bodies. I would love to see your ideas for lunches using less deli meat, which is generally really high in sodium and often filled with undesirable additives and preservatives. I am trying to pack lunch for my daughter that is as wholesome and un-processed as possible. Thanks! Then buy the whole piece of meat and slice it yourself. Turkey breast, spiral ham, whatever. Make pimiento cheese, guac, etc. That’s just swell your family is too good for nitrates, what on earth have you been feeding them thus far that you can’t figure out how to adapt a list like this? I’ve also shyed away from sandwiches as I’m trying to get my kids to eat less wheat and gluten, so it’s a daily challenge to not only be creative with lunches but in also providing them with enough energy to get through their day! results. No resting or taking a little step prior to next jump. EEKkk this blog literally gave me butterflies ! I seriously lack in the creativity department and this has me inspired ! I cannot wait to go shopping and make some of these yummy roll ups and fruit cups. My kids will be thrilled to open up their lunches now !! No more throwing out and wasting good food. Thanks for the great post. Cant wait to check out some more of your great articles ! Thank you for all the lists. Thank you for sharing all these. Thank you for sharing all these. Such a great and awesome recipe. Love these! We have new containers pre-divided with Tupperware and I will be suggesting to follow your great suggestions! THANK YOU FOR NO NUT!!! My kids are allergic to peanuts so it’s great seeing a blog where a lunch isn’t PB&J or peanut butter and celery/apples. The only one I would ask that parents not pack in lunches is shellfish like shrimp. More people are allergic to shellfish than peanuts. Shellfish is the number one allergen leading to fatalities. Curious if you are still happy with the bento boxes that you recommended? I ordered a different brand, and one broke only after two weeks.